Tourist map of city monuments in Seville, Spain. 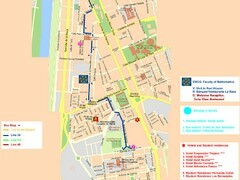 Shows 8 walking route itineraries. Tourist map of Seville, Spain. Shows 99 points of interest.